Today promised to be another fantastic day weatherwise and it was. However, there was a little bit of cloud and a bit of a breeze which made it a bit more bearable. The team in Area 1 continued to clear off the last layer of ploughsoil and expose the surfaces of the features underneath. 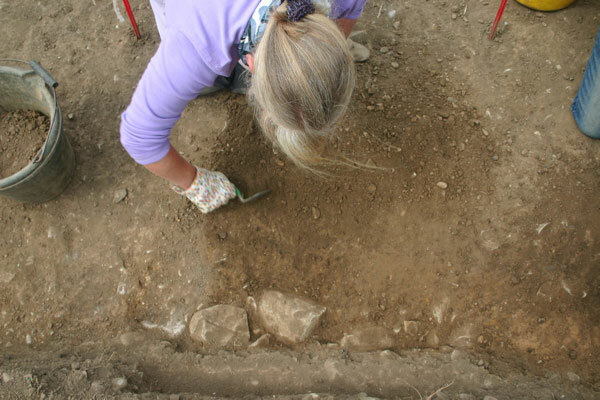 They have now reached the topmost rows in the trench and the whole surface will have been cleared by tomorrow. It is looking very well and, as outlined yesterday, major features are visible. It will be very interesting to record these and then begin to dig them one-by-one. Some nice finds came up again today – several pieces of flint and a fragment of another blue glass bead, probably dating to the early medieval phase of occupation. 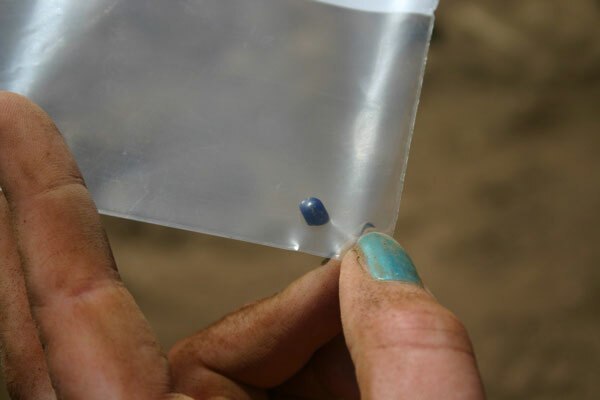 The bead was not complete like the previous one and Jamie, who found it, did very well to spot it. 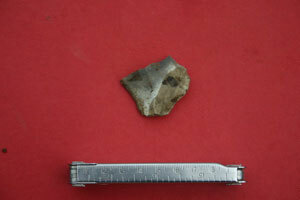 The fragment is so small it wouldn’t have been picked up in the sieve either. It seems to have been more delicate and thin than the one from last week. 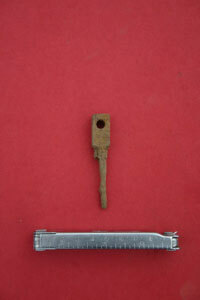 A flint scraper from Area 2. 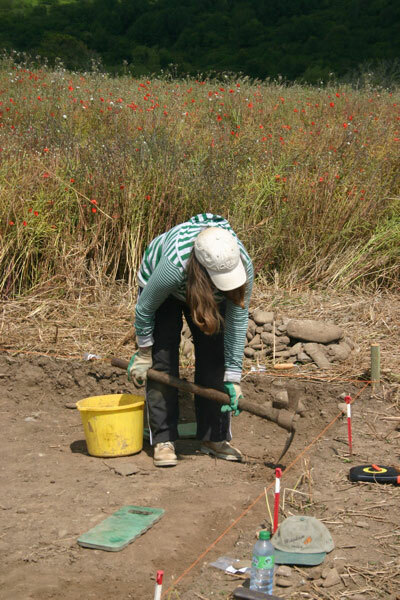 In Area 2 the same questions dogged the team there – have we got base of ploughsoil or is there a spread of occupation material? 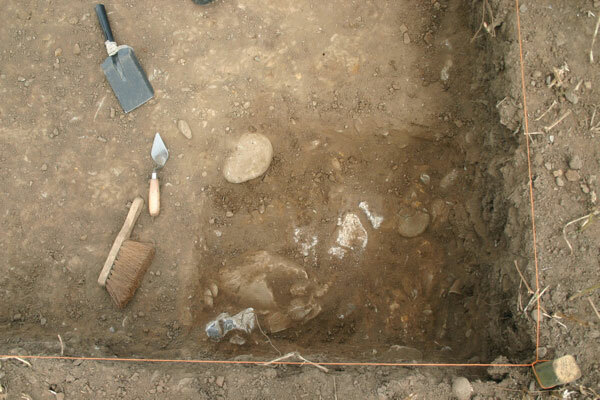 It seems clear now that there is, in fact, a spread of material below the base of ploughsoil which has frequent large pieces of animal bone – a good indicator that it is undisturbed by ploughing as this would cause a relatively delicate material like bone to break down into smaller pieces. 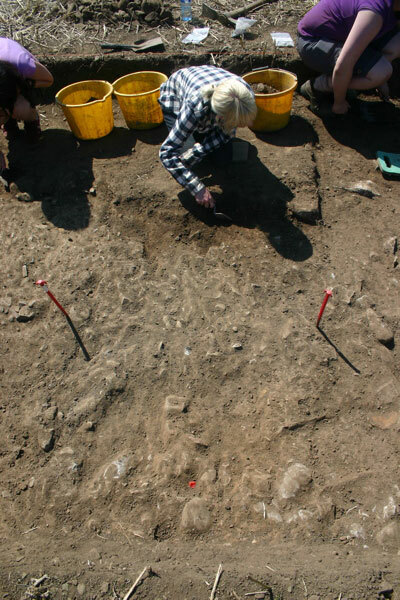 We took the decision to expose this layer as fully as possible and then record it by taking photographs the surface and then drawing a scale plan of it. While this final clean-back was being completed, a couple of possible features became apparent. These are small circular or sub-circular areas of slightly darker soil with charcoal flecking, and may be something like post holes. When the planning is finished, we will take a closer look at them. 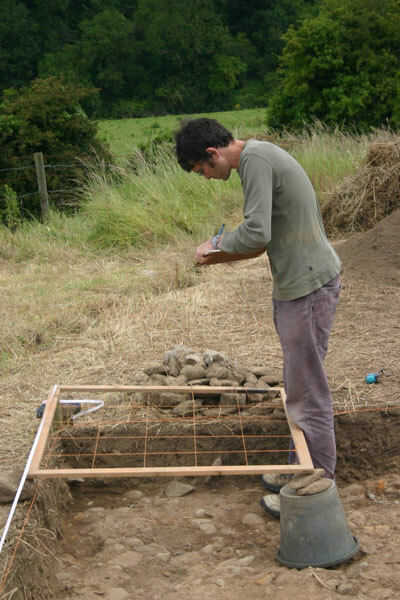 Matt set up to draw the plan using a long tape to orient himself relative to the site grid and a planning frame to help draw the detail on the surface, metre square by metre square. 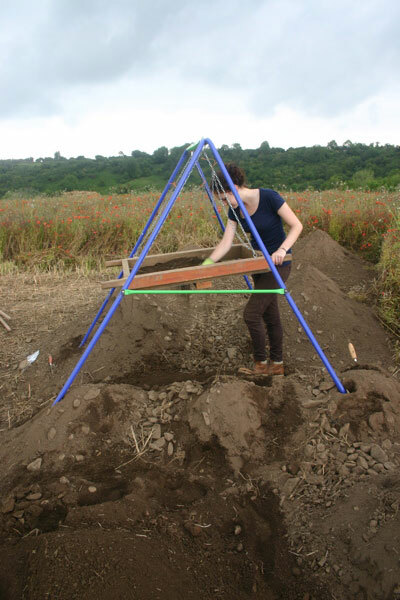 You don’t have to be an artist to do this – it is a technical rather than an artistic process – but, like so much in archaeology, it requires time, patience and a thorough meticulous approach. The others in the Area 2 team were now redundant – as Matt was busy planning, they couldn’t dig in that cutting or they would be in the way. 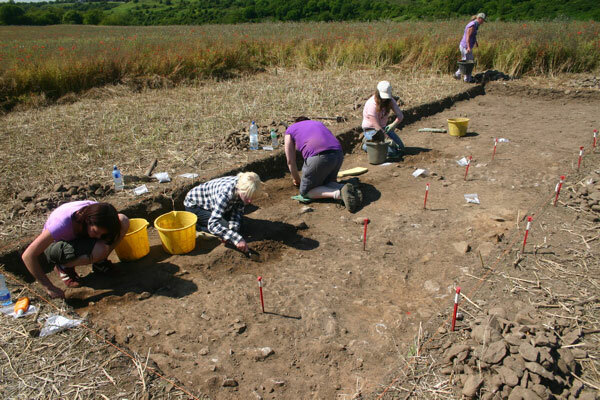 Also, as the trowelers began to finish their strips in Area 1 they came across to Area 2 to join the diggers there. They started work on a third cutting which will ultimately join with Cutting 7. This is a 2m x 7m trench extending southwards and will investigate further anomalies identified in the magnetic gradiometry there. 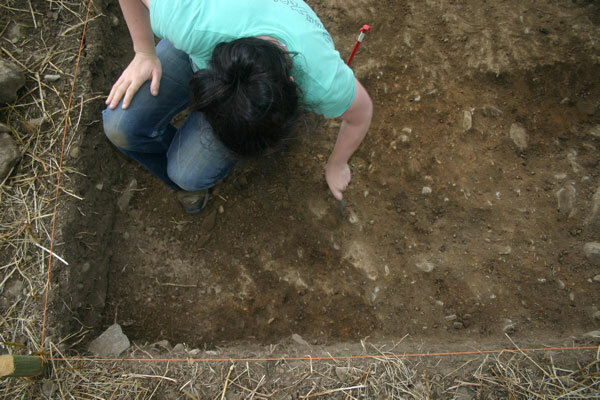 As with the previous trenches, we used long tapes set out between the site grid pegs to position the trench relative to the grid and set out a line to define the edges. 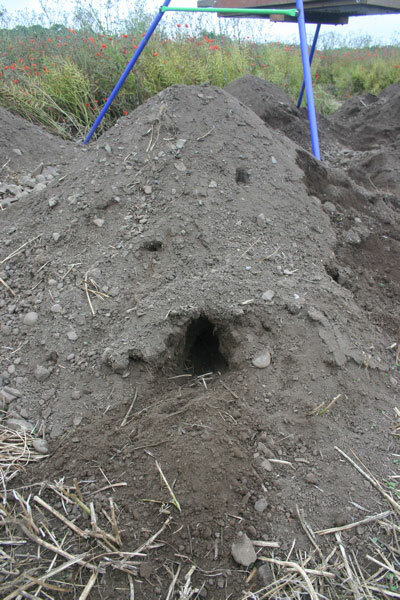 This time we cleared off the loose stalks from the surface to help with the digging and sieveing process. 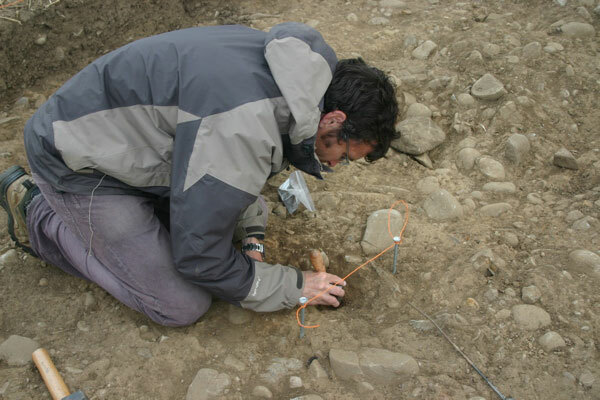 The first step, however, before the digging could begin, was to take a series of magnetic susceptibility soil samples, to keep a consistent record. 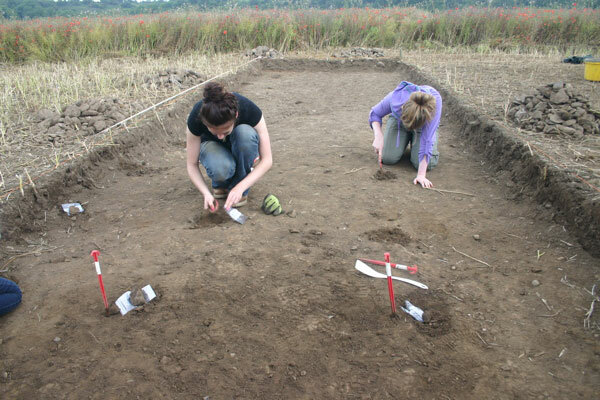 By late afternoon the first square had been almost completely dug and sieved. More of the same tomorrow; hopefully the weather will hold up, although the forecast is not good. We’ll take it as it comes. Day 8 – What a scorcher! 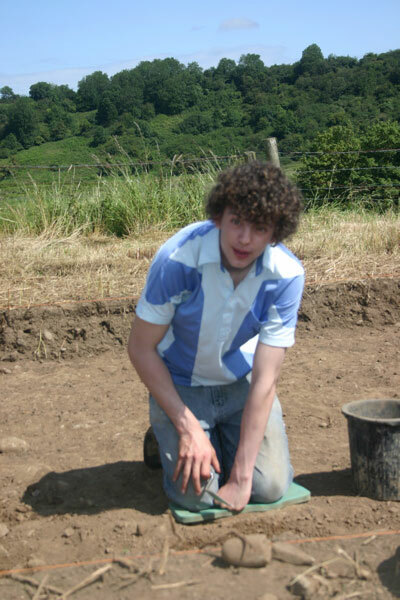 Tomás troweling in Area 2. Today the weather was fantastic – one of the best days on site so far. Sun hats and sunblock were very much in evidence all day. Mind you, if you think we were happy about this, think again. 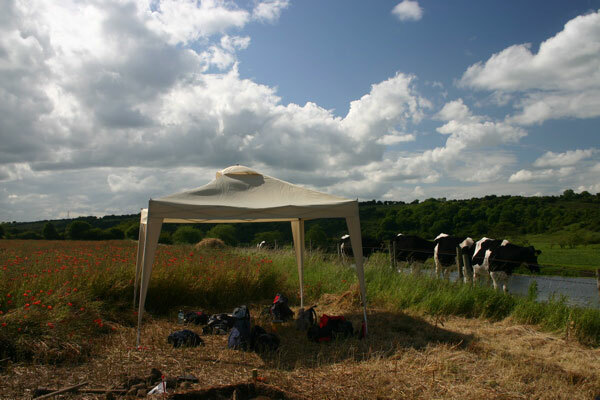 The hot weather was causing difficulties for the archaeology. As soon as an area is freshly troweled, it dries out and becomes a grey-brown mass of crumbs. Elsewhere, in the untroweled areas, the surface is becoming baked to the consistency of concrete. We’re never 100% happy with our lot – there’s always something to give out about! The Area 1 team hard at work. 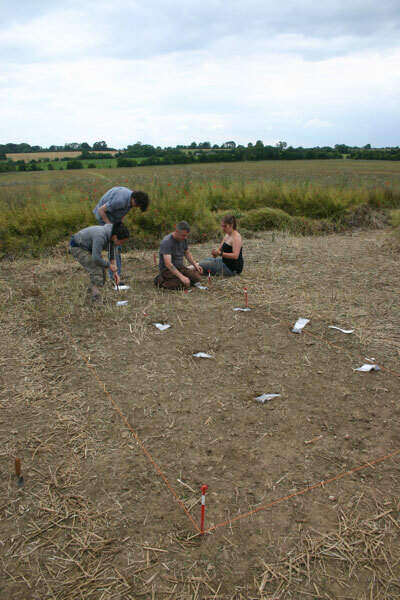 In Area 1 the work continued taking off the last layer of ploughsoil in an attempt to reveal and recognise intact archaeological features as indicated on the magnetic gradiometry plot. 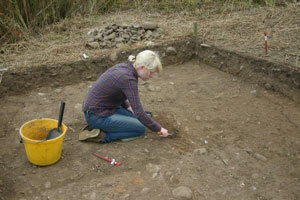 Ciara came over from Area 2 to help out and was glad to get away from sieve duty there for a change. 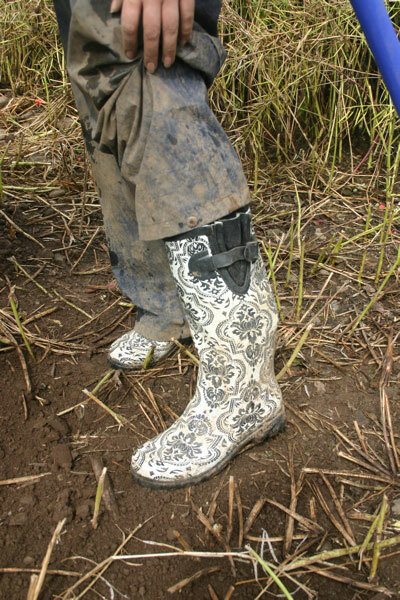 As outlined already, conditions were difficult and presented a bit of a challenge to the novice trowelers. It is a slow and sometimes frustrating task, especially when you are unsure of what exactly it is you are looking for. 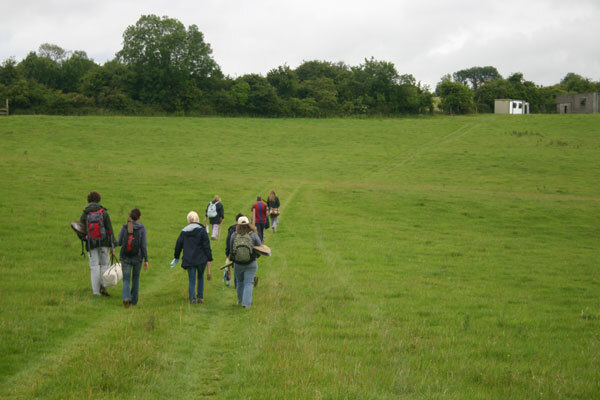 The dry conditions don’t help, making it even more difficult to keep your area clean. 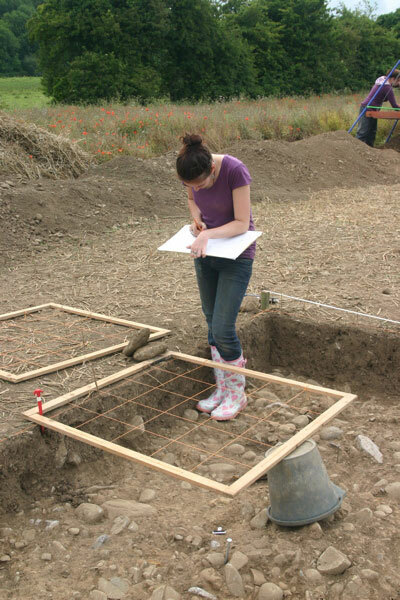 Troweling is an activity that takes some degree of concentration. 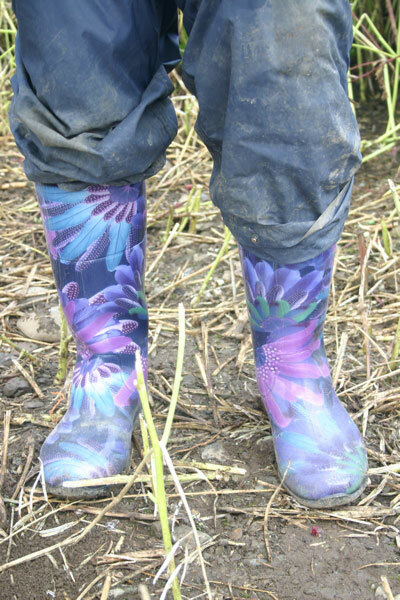 The troweler needs to work very methodically, removing a thin layer of soil from your area and leaving the surface clean and ‘fresh’ so that the texture and colour is visible or at least discernible. When troweling, the excavator needs to be constantly asking questions of the soil in front of them – is this area different to that one? If so, how is it different. 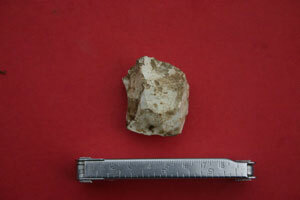 Is it the colour of the soil, the texture, its stoniness, the inclusions? If there is a diffrence, where is the junction? is it a clear line or a gradual transition? All of this goes towards understanding what features are present on a site and contributes towards their accurate description and recording. It is not an activity where you can just ‘switch off’. You need to be constantly thinking. Anyway, we made good headway in Area 1 and despite the dry conditions were able to start recognising different features and some of the edges between them. 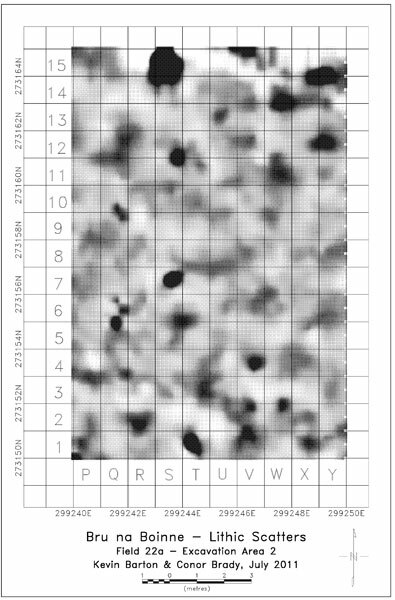 An additional bonus was that these seem to match up well with the anomalies identified by the magnetic gradiometry plot. It seems that we are on the right track here. In Area 2 the story is a bit different. They continued to take down the material we are calling ‘base of ploughsoil’. 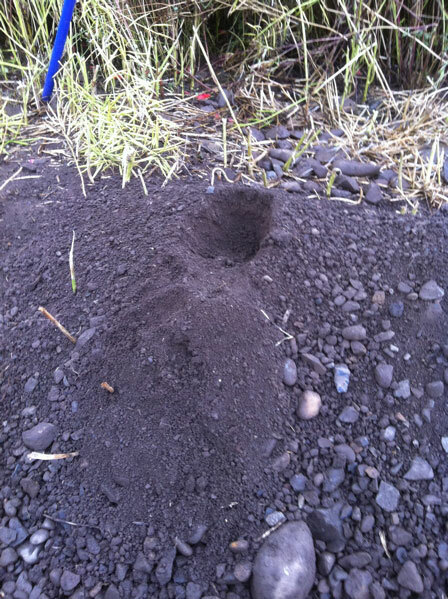 Already the cutting is over 50cm deep, which is about 15cm to 20cm deeper than Area 1. 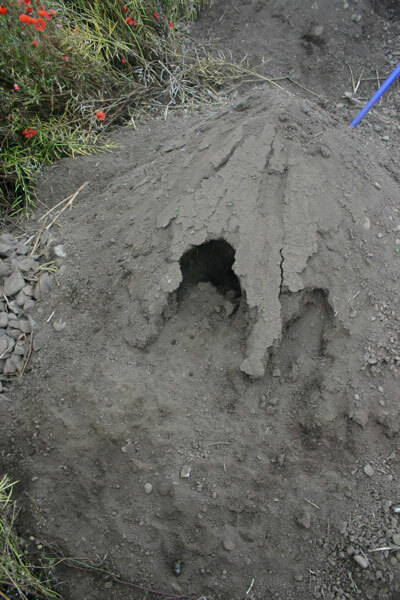 Even at that level, in areas that yesterday were looking like undisturbed ‘natural’ or subsoil, there are fragments of animal bone and flecks of charcoal indicating that the soil is, in fact, disturbed. 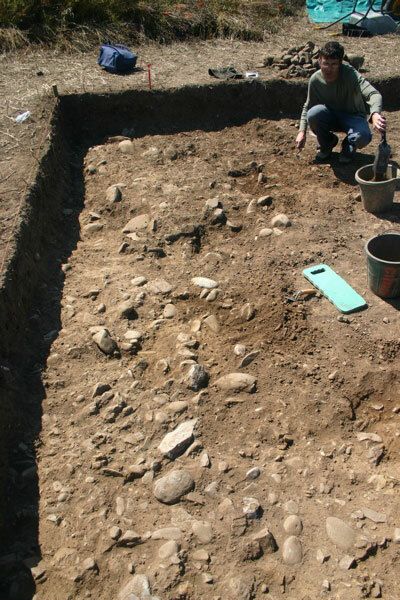 We may have a situation in this area where there are no defineable features but rather the remains of a spread of occupation material lodged in between and just above the cobbles of the intact natural. Our nocturnal visitors had been back again to the site and this time they seem to have tried to set up residence in the Area 1 spoil heap. When we arrived down to the site this morning there were several burrows dug into the heap with a series of cute little footprints all around. They seem to have given up, however, as the holes weren’t too deep and were apparently unoccupied. 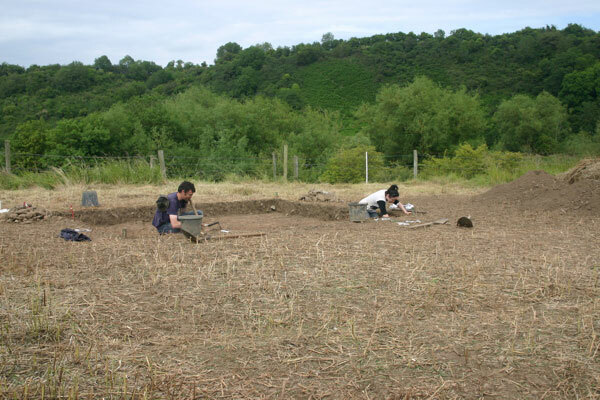 As long as they confine themselves to the spoil heap I don’t mind too much – on some other sites I have dug on rabbit burrows had done a lot of damage to the archaeology. For some reason they don’t seem to be interested in the Area 2 spoil heaps. Sophie and Sarah taking soil samples in Area 1. Troweling down in Area 1. 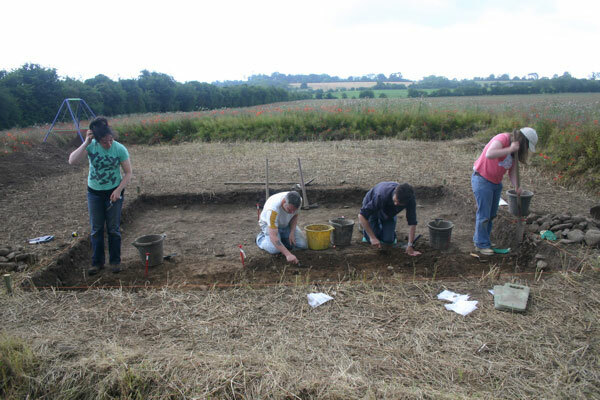 On the work front the last of the ploughsoil was taken down – two half squares and one full square. This was easily achieved before the morning break and there was a certain air of proud satisfaction at the final moment. 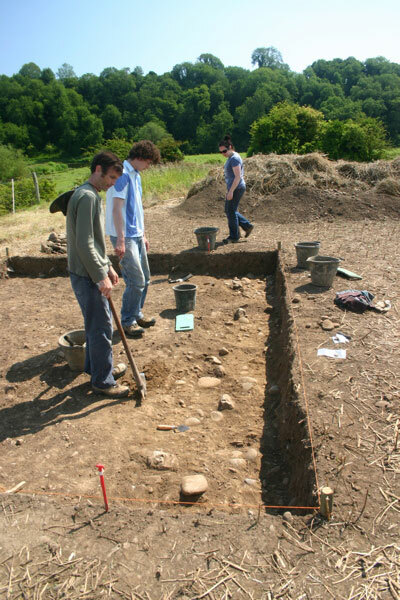 30 square metres of ploughsoil removed and sieved since the start of the dig. 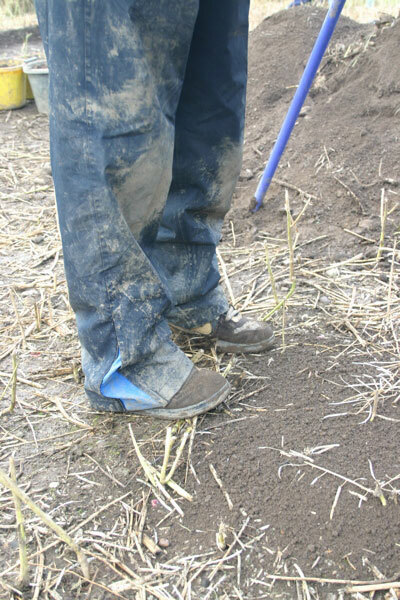 After the break we took a second series of magnetic susceptibility samples from the base of ploughsoil using plastic implements in order to reduce the possibility of contamination. 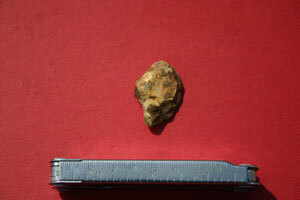 One sample was taken from each metre square and duly brought up to the cabin at lunch time. Once this was done we were ready to start troweling the surface to remove the last skim of ploughsoil and start identifying the features. Working from east to west in column I squares 1-5, we uncovered a band of hard, compact, yellowish soil which gradually gave way to darker slightly less compact, more fill-like soil with frequent flecks and larger pieces of charcoal and animal bone, also with occasional pieces of flint. This looks like the top of the fill of the north-south ditch identified in the geophysics. We will continue tomorrow and see what emerges. The sondage in Area 2. Matt and Eimear in Area 2. 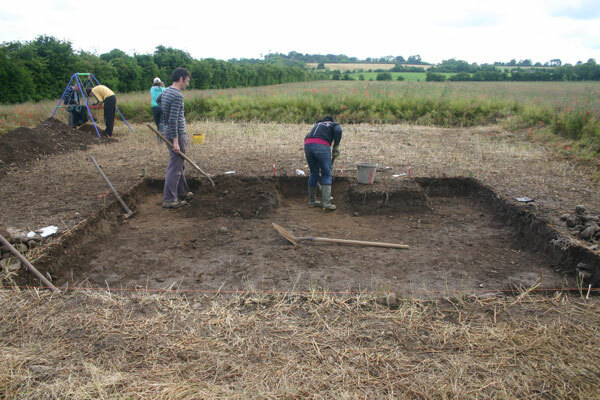 In Area 2 Matt, Tomás and Ciara continued to take down the last skim of ploughsoil using a combination of troweling and mattocking. As described yesterday, a number of possible features had been identified yesterday along the northern side of the cutting. However, there were no similar features visible elsewhere in the cutting that might correspond the the geophysical anomalies. 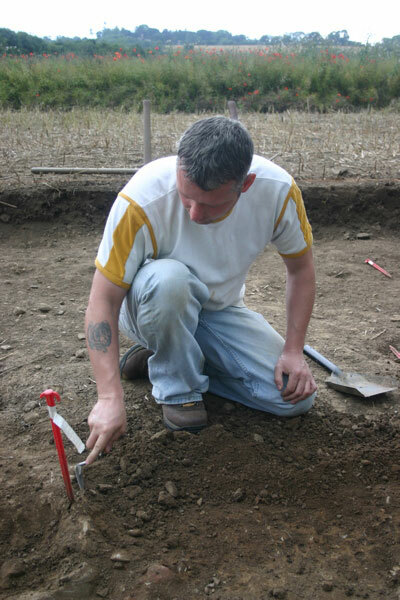 Matt carried out a sondage, or test area, in the extreme southwest corner of the trench to determine exactly where subsoil was located and it emerged that there was another 10 to 15cm to be taken down. 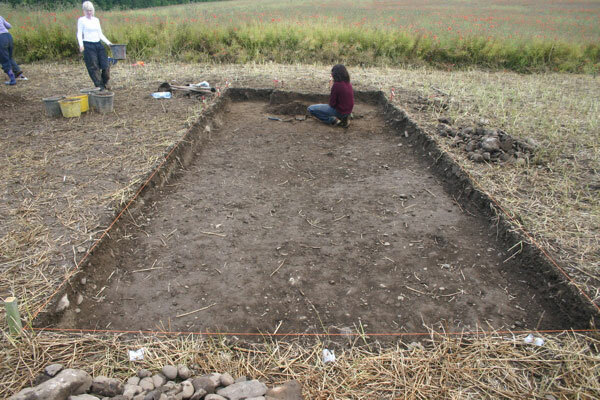 Thus, although the northern edge was relatively clear, there seems to be a shallow wedge of ploughsoil thickening towards the southern side of the cutting. 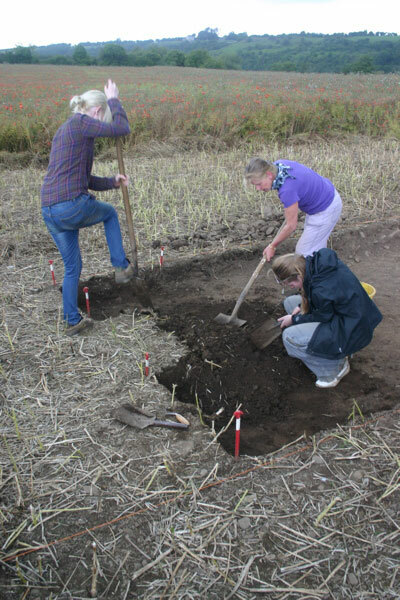 There is usually an occasionally disturbed zone at the very base of the ploughsoil which is transitional between fully disturbed ploughsoil and never disturbed natural/subsoil with archaeological features. When ploughing takes place in a field, it doesnt necessarily plough to exactly the same depth as previous years with the result that there is no clear ‘line’ or interface between ploughsoil and ‘unploughed’ soil. 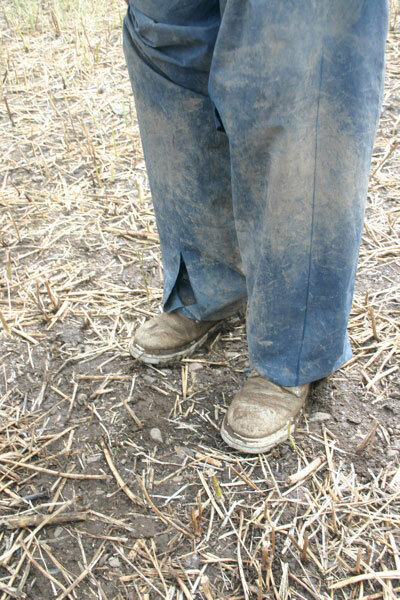 Sometimes, depending on local soils, it is difficult to easily distinguish between regularly ploughed ploughsoil, occasionally ploughed base of ploughsoil and subsoil and it takes a bit of deliberation to establish where each ends and the next begins. Tomorrow they will remove this and trowel the surface back and hopefully we will see some more features. Day 6 – Moving up a gear. 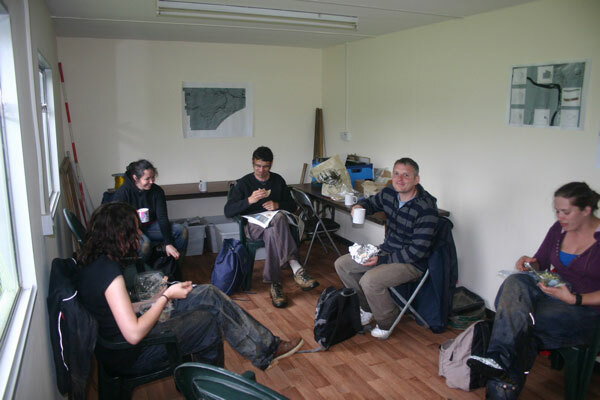 We all arrived down to the site hut revitalised, reinvigorated and ready for the new week. 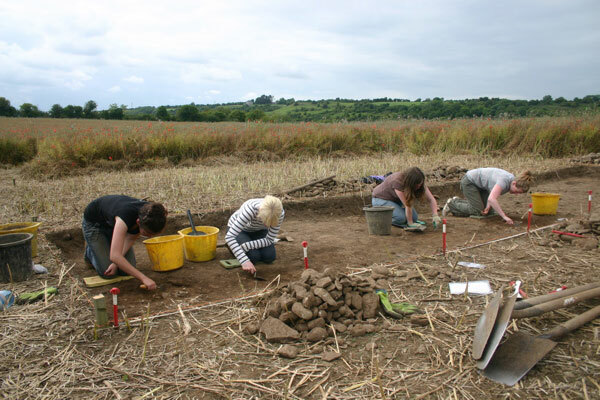 We were close to being completely free of the monotony of mattocking, shoveling and sieving through ploughsoil, although the finds we are coming across are nice. 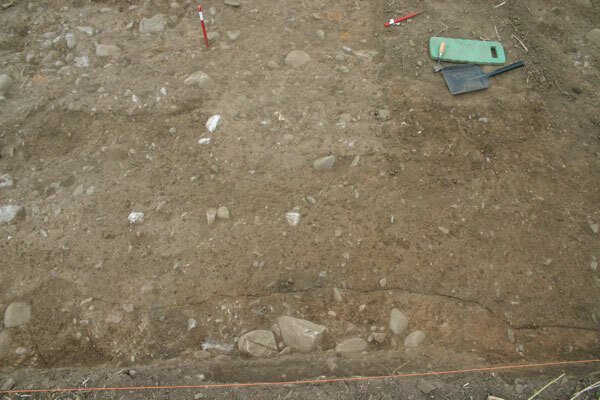 In Area 1 at the start of the day there were still 10 square metres to be dug away and throughout the day the team there got through seven and two half squares. Tomorrow, there are only two half-squares and one full one to go. Once they are gone, we will be nearly ready to begin to search for the features identified in the geophysical surveys carried out by Kevin before the dig started up. In the plot the cutting itself is made up of columns G, H and I and extends from row 1 to row 10. This takes in two very distinct features: one, a possible ditch running from north to south (from previous geophysical surveys this seems to be the innermost enclosure defining the knoll of high ground) and the second, at a higher level and cutting the other feature curving in from the middle of the right side to the bottom of the panel (this seems to be a separate oval enclosure superimposed on the other ditch. See the original plot HERE). This cutting will investigate the exact relationship between these two separate features and hopefully will yield material for dating. 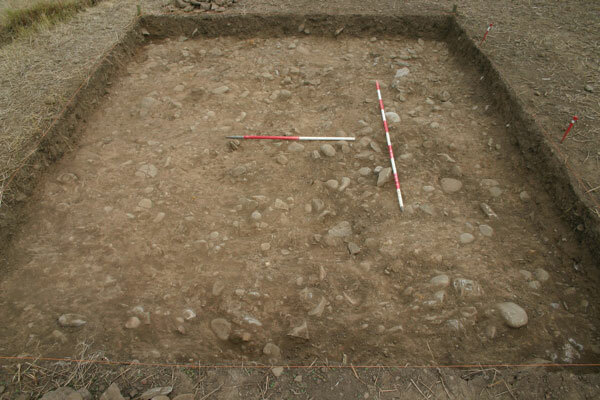 In Area 2, they started the day with just two metre squares to go and these were quickly removed and sieved. 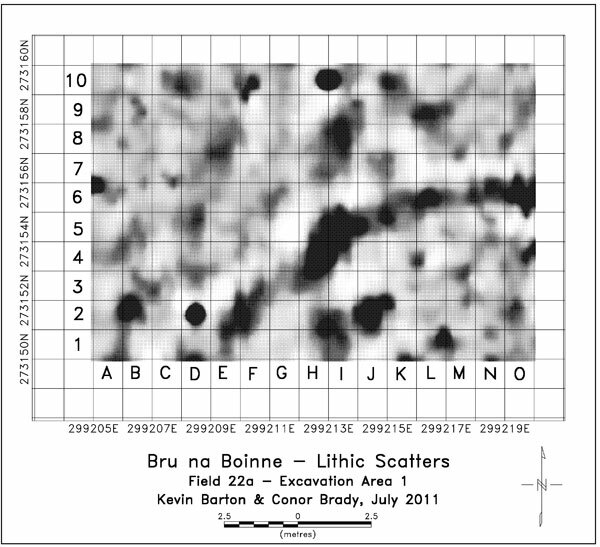 Once this was completed, we took another series of soil samples for lab magnetic susceptibility measurements using the same grid as before. 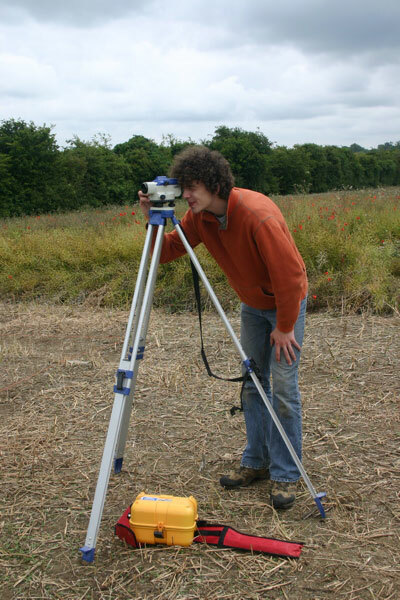 Thus we will be able to compare values taken from the field surface to those at the base of ploughsoil. Once this was done the cutting was ready to be troweled back. There was still a layer of ploughsoil over the cutting – we deliberately didn’t remove everything when we were mattocking off the ploughsoil partly to protect the site from being open too long and from the impact of people crossing over and back as they work. 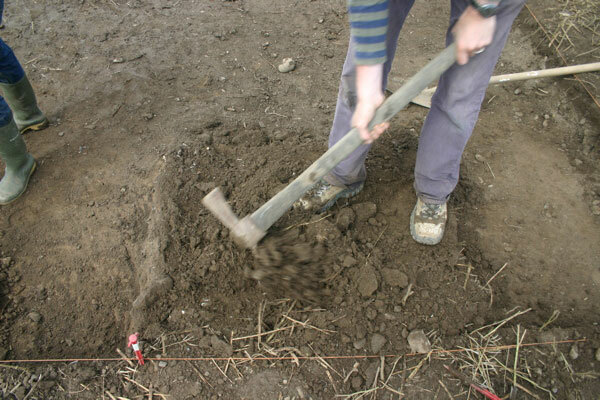 Trowelling, with the help of some light mattocking where necessary, is the next step taken to remove any remaining layer of disturbed ploughsoil and begin to identify the features underneath. We are lucky in that we have a very detailed set of geophysical plots to guide us as to what to expect. However, the picture here is less clear with a series of features that are unfortunately less identifiable than those in Area 1. The excavation here is to explore the nature of these possible features – our hunch is that they may be houses because of their location within the innermost enclosure on the highest point in the site – but we will be scratching our heads if we don’t end up finding the features indicated on the geophysical plots. The cutting itself measures 5m x 4m and is located between squares Q10-13 and U10-13 although this will probably be extended southwards at a later stage. Eimear searches for the feature in square U13. All hard at work in Area 2. Evidence of a nocturnal visitor. First thing each morning I check over the site to see that it is as we left it the evening before. This morning, there was evidence of a visitor for the first time since we started and it looked like they were having a go themselves. They may have been small and furry and luckily they confined themselves to one of the spoil heaps and didn’t make a mess! 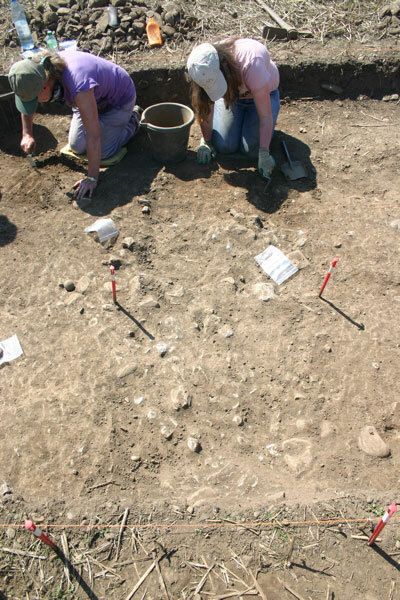 The work of the previous days continued, unfortunately at this stage it is fairly repetitive – mattocking, shovelling and sieving – and not very exciting, apart from the occasional finds of flint. 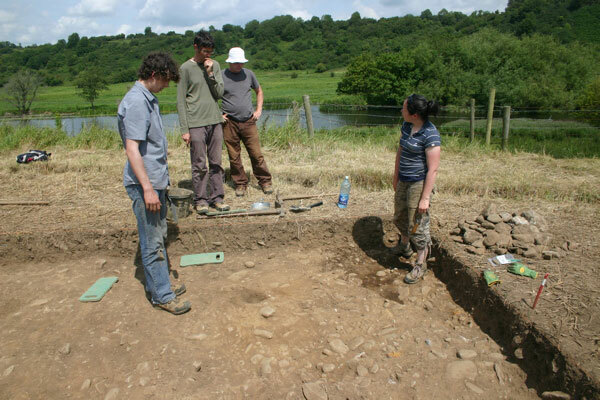 Once we get all of the ploughsoil off and we can see archaeological features, things will be much more exciting. Nonetheless, everyone has their trowel at the ready, just in case. An ‘experienced’ trowel beside a novice. 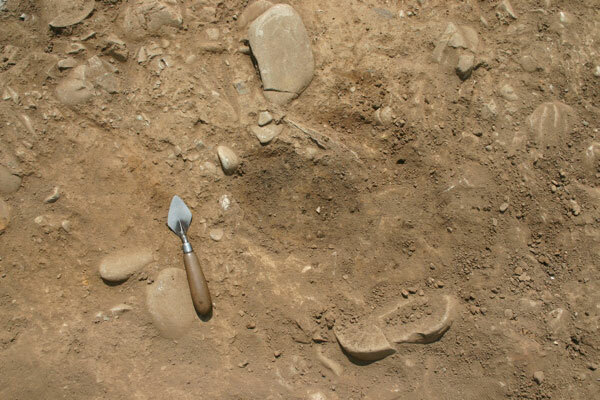 Continuing what I said in yesterday’s post about mattocks and shovels being the more used tools on archaeological sites, trowels are nonetheless regarded by the public as the quintessential archaeological tool. This is also true for archaeologists themselves and trowels become very important personal possessions over time and even indicators of the extent of the experience of the owner. The loss of a seasoned trowel often triggers a grieving process on the part of the owner, especially if the trowel has been with its owner for a long time. 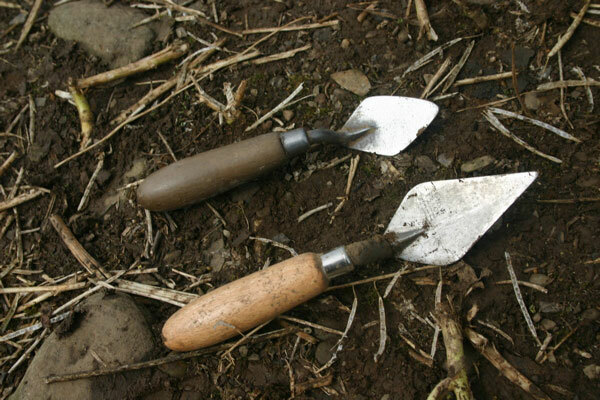 All of the volunteers on the site at Rossnaree bought their own trowels for the dig and will hopefully be using them again and again in the years to come. With use, trowels can become very worn with the ‘blade’ wearing down to a fraction of its original size. 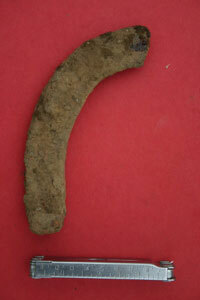 The more worn a trowel is, the longer the owner has been digging and the more experience they have. Lunch in the luxury of the cabin. Conditions on the site were unpleasant today with persistent misty grey drizzle occasionally developing into light rain for much of the morning. 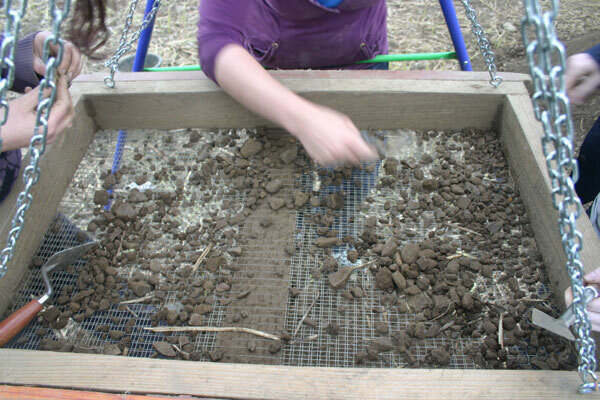 Sieving the soil became quite difficult, especially soil taken from close to the ground surface. Soil from deeper down was still relatively dry and sieved very well. Everyone got a bit muddy over the course of the day. 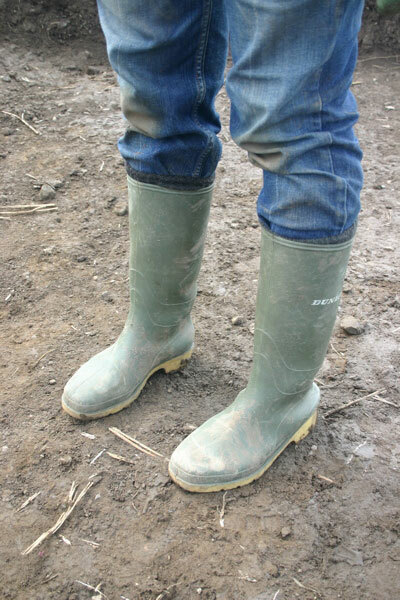 Above is a selection of the wellies and wetgear in use on the site. Breaktimes become all the more important in these conditions and today, for the first time, we had tables and chairs in the cabin. 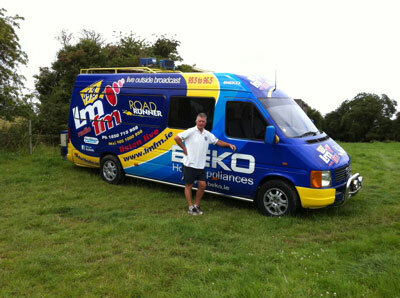 Thanks again to Fin for the early delivery on the way to the Blackfriary site in Trim. Again, in spite of the conditions, very good progress was made and we are aiming to have both cuttings cleared and ready to be cleaned back (with trowels!) early next week. A big thank you to all of the volunteers who worked so hard all this week. I hope the weather hasn’t put you off and that you’ll all be back again on Monday for a more interesting and exciting week. In sporting parlance, it is still all to play for! A little taste of Egypt on the Boyne. The gang arrived again bright and early on site for another day’s digging, not having been deterred by the torrential shower of rain the previous day nor by the pretty poor weather forecast for today. We optimistically erected a gazebo to act as our on-site shelter as the cabin is located some distance from the site itself. It certainly added a certain atmosphere to the site, especially when the sun was shining! Unfortunately, in only a relatively light breeze, the gazebo broke. I still have the receipt and will be returning it to the shop. Luckily, we had no need of shelter, in spite of the weather forecast which was less than promising. However, we have the feeling that before long we will need something to huddle under. The contents of the sieve. The crew on site today was slightly smaller than other days but undeterred, we continued in both trenches to dig and sieve. Good progress was made as the weather was with us and there were no delays or stoppages. In Area 1 Cutting 6 we started on squares G9 and I9 and by the end of the day a total of six square metres had been cleared completely giving a cumulative total of 9 square metres altogether. The pace is picking up as the crew find their rhythm. In Area 2 Cutting 7 the crew continued to take down squares U12 and T12. They also went back to the squares cleared yesterday to deepen them slightly. 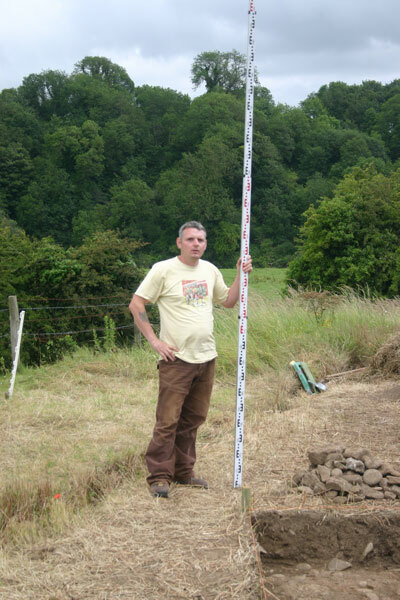 We are working down to a level of about 25cm which, although not the base of the ploughsoil, seems to be close. 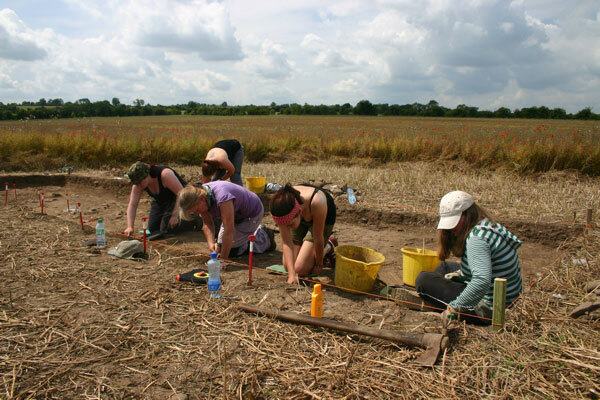 Once all squares are cleared to this depth, we will first of all take samples for lab magnetic susceptibility measurements and then we will trowel over the exposed surface to remove the final skim of ploughsoil. Once this is done in both areas, we should be able to see the intact archaeological features identified in the geophysical surveys.